As the Facilities 450mm Consortium works to enable the transition to a new wafer size, it is important to remember how the semiconductor industry reached this point and what are the economic factors that drive such an evolution. 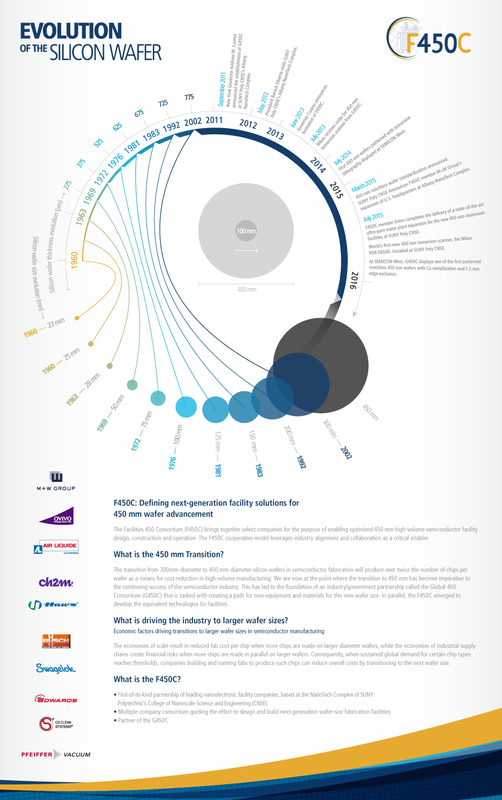 The infographic below presents a high-level overview of the history of the wafer followed by the milestones we’ve reached with 450mm technology so far. The visual representation exemplifies the collaboration necessary to scale up in wafer size while taking the history of the silicon substrates and their increasing size and thickness into account. Explore the infographic below and check back regularly for the latest version, complete with new breakthroughs in 450mm process and facility technology. The Facilities 450mm Consortium (F450C) is a first-of-its-kind partnership at SUNY Poly’s Albany site that is leading the global effort to design and build next-generation 450mm computer chip fabrication facilities. The collaboration includes many of the world’s leading nanoelectronics facility companies, including Air Liquide, Busch Vacuum Pumps and Systems, CH2M, CS Clean Systems, Edwards, Haws Corporation, M+W Group, Ovivo, and Swagelok. Members of F450C are working closely with the Global 450mm Consortium (G450C), as announced by New York Governor Andrew M. Cuomo, to identify viable solutions required for 450mm high-volume facility construction, with initial focus areas to include reducing tool installation cost and duration, and improving facility sustainability. The vision of the F450C is to lead the global effort to design and build the facilities to support the development of the next-generation 450mm computer chip. By working closely with members of the G450C, the consortium will align on facility standards and necessary infrastructure that drive the cost, duration, safety, sustainability and environmental footprint needed for the transition to 450mm technology. The primary objective of the F450C is to enable nanoelectronic fabrication facilities to transition to 450mm in collaboration with the world’s leading semiconductor facility companies. The member companies and affiliates of the consortium will work with suppliers and other associations to develop standards in support of 450mm high-volume facility construction and infrastructure solutions. What is the Global 450 Consortium (G450C) Program? a New York based consortium. built on the base program started under ISMI’s R450 Program. funded to collaboratively work with suppliers to develop 450mm equipment. using wafers, equipment, people and cleanroom space to develop and test equipment to meet industry needs. The vision of the G450C is to be a public-private partnership program (New York State (SUNY Poly’s Albany site), Intel, TSMC, Samsung, IBM and GLOBALFOUNDRIES) that develops cost-effective test wafer fabrication infrastructure, equipment prototypes and high-volume tools to enable a coordinated industry transition to 450mm wafers. The program will use the capabilities established at SUNY Poly’s Albany site for joint development activities and support of a comprehensive industry ecosystem. enable OEMs and tool makers to transition to 450mm in a highly coordinated fashion under a financially (New York) leveraged business strategy; and work with suppliers and other associations/consortia to develop standards and support the development of common equipment building blocks.